Arnold Schönberg once remarked on his student Anton von Webern that he was able to “express an entire novel with a single gesture”. 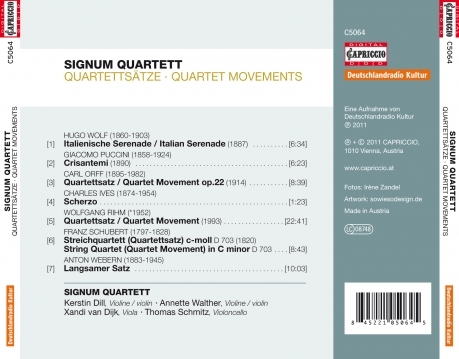 In doing so, the composer arrived at the maximal condensation of expression through small dimensioned designs. 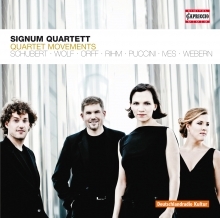 Hugo Wolf composed his one-movement serenade for string quartet within three days and Giacomo Puccini wrote a melancholic quartet movement in C sharp minor in a single night as he claimed himself. 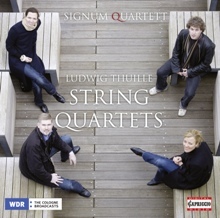 With this interesting Edition of musical fragments and Quartet Movements which found their ways to the concert schedules worldwide, the young SIGNUM QUARTET presents his second album after the successful release of the recording of String Quartets by Ludwig Thuille (Capriccio C5049). Again with a wide range dynamic and fresh performance.